The purpose of plug-in load balancing is to prevent audio dropouts caused by high effect processing loads. 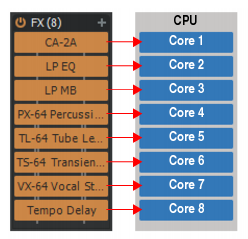 When using multi-core CPU processors, SONAR allows you to increase the number of plug-ins you can use in a project by distributing the processing across multiple cores. The biggest benefit will be seen on systems with 4 or more physical cores. A project’s biggest processing load is normally attributed to plug-in processing, which can lead to CPU spikes, inefficient load balancing among the cores on a multi-core PC, and audio dropouts. SONAR’s plug-In load balancing exploits the full power of multi-core CPUs to balance DSP workloads across multiple cores when possible. This can lead to better CPU loading and fewer spikes in the audio engine. To enable/disable plug-in load balancing, go to Edit > Preferences > Audio - Playback and Recording and select Plug-In Load Balancing. This option is only available if Use Multiprocessing Engine is enabled. When enabled, SONAR will attempt to load balance FX Racks that contain two or more unbypassed plug-in effects, including track FX Racks, bus FX Racks, clip FX Racks, FX Chains, ProChannel FX Racks, and ProChannel FX Chains. Enabling Plug-In Load Balancing does not introduce any latency. To determine if a project will benefit from plug-in load balancing, first check the Control Bar’s Performance module to see if any cores are spiking. The Performance module lets you monitor the activity of each CPU core. For details, see Performance module. Note: The Control Bar’s Performance module can display several different CPU meter modes. To display a meter for each core, right-click the Performance module, point to CPU Meter Options, then select Audio Processing. For details, see CPU meter modes. The project experiences excessive core spiking or one core is significantly higher than others. If the CPU load is even to begin with, there likely won’t be any benefit. The project uses a high audio latency setting. If one track is performing most of the effects processing. Load balancing itself incurs some overhead since internally it subdivides and processes the plug-ins at smaller buffer sizes. If the loads are not unbalanced to start with, this overhead can exceed the benefit. The CPU load is even to start with (there is no excessive spiking of cores or one core is not significantly higher than others). The project uses many lightweight plug-ins with similar load. All tracks use about the same number of effects or have similar load. The project uses a low Mixing Latency Buffer Size setting (<256 samples) in Edit > Preferences > Audio - Driver Settings. Synths in the Synth Rack. These are not processed serially and do not benefit from this technology. FX Racks that have plug-ins with active side chains. It is important to understand the impact load balancing has on CPU load. Load balancing reduces processing time but potentially at the cost of increased CPU use. When enabled, SONAR attempts to share processing load of all plug-ins in FX Racks by distributing the load among the available cores. By default, if the Mixing Latency Buffer Size setting in Edit > Preferences > Audio - Driver Settings is < 256 samples, it is too low for load balancing because the buffers cannot be subdivided further. This is equivalent to Plug-in Load Balancing being disabled for all FX Racks. This threshold can be tweaked by changing the MinPluginLoadBalancingBufferSamples variable in Aud.ini, which controls the size of the smallest internal buffer subdivision that may be used for plug-in load balancing. The minimum value is 32 samples and the max is 256. The default value is 128 samples. Lowering the value will make load balancing more aggressive and consume more CPU for processing, but normally there should be no need to adjust this value. The MinPluginLoadBalancingBufferSamples setting should not be confused with the Mixing Latency Buffer Size setting. Load balancing subdivides the audio buffer into multiple smaller buffers depending on the number of plug-ins in the FX Rack. If the Mixing Latency Buffer Size value is smaller than MinPluginLoadBalancingBufferSamples × 2 samples, then load balancing has no effect. Go to Edit > Preferences > Audio - Configuration File. Under Configuration Settings, click Edit Config File. The Aud.ini file opens in the default Windows text editor. Save Aud.ini and close the Windows text editor. Click Reload Config Settings to reload the current audio configuration settings from Aud.ini.